For a couple seeking an outside-the-box contemporary design for their new home’s master bathroom, Savvy Surrounding Style drew inspiration from fine hotels the homeowners visited in their travels. The resulting 200-square-foot retreat includes custom elements such as a beautiful, freestanding soaking tub, open, freeform shower with rainhead and glass wall and bench. 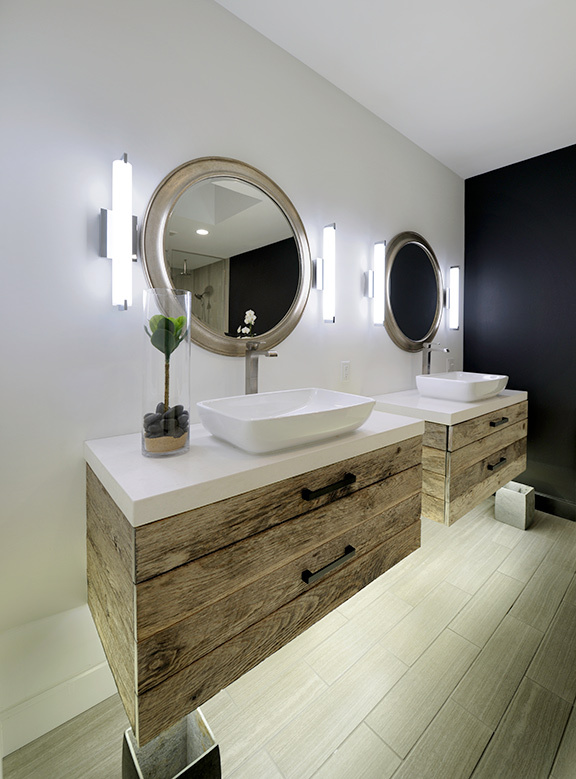 Floating, underlit barnwood vanities with glass-bowl vessel sinks add a contrasting texture to the luxurious space. Lighting at the mirrors enhances the floating effect of the vanities. Wood-look porcelain floor tile completes the contemporary space. Why the judges love it: The minimalistic design of this master bath has a museum quality and a high level of sophistication. The play on textures is outstanding, and the barnwood works well in the mix.